The Masked empire is growing in strength. 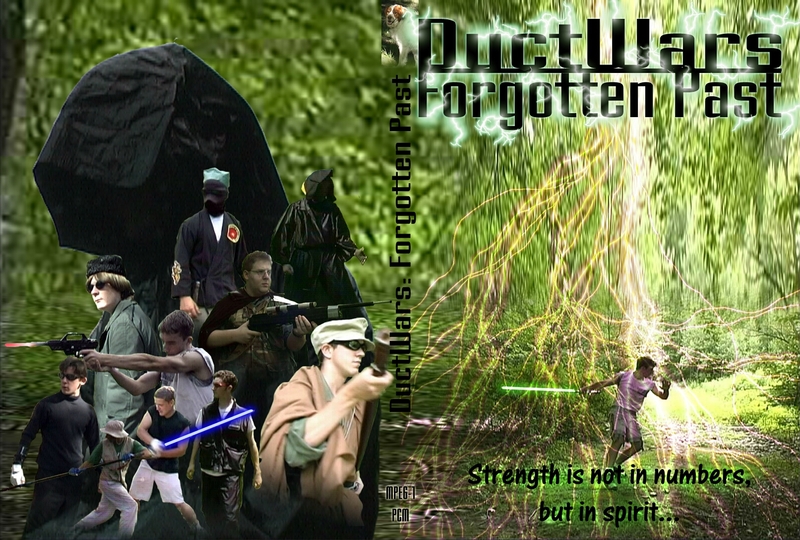 Council members Juan Zi Nobie and Dantin must find new recruits to help fight for the Ductorian way of life. Juan Zi Nobie and Dantin have retired from active duty and are replaced by Christo and Katano. 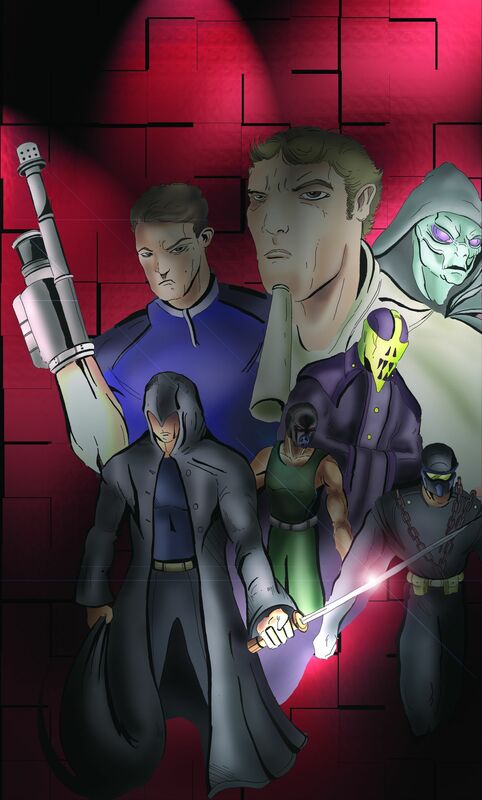 The Masked empire hires a freelance rogue to kill the ally Silver Alien and use his identity to wage war on the Ductorians. Juan Zi Nobie is on his death bed. Emperor Namos has risen from the dead and Juan Zi recounts the story of his youth and how he fought the Emperor years ago. 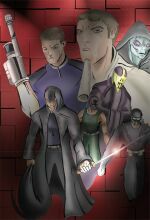 The Emperor, after rising, brings back the Masked inVader from 'The Rebellion' and Schlim from 'The Silver Enemy' and forms a lethal group with 8 other warriors. Christo, Katano and the freedom fighters from years past all must engage in the final showdown. 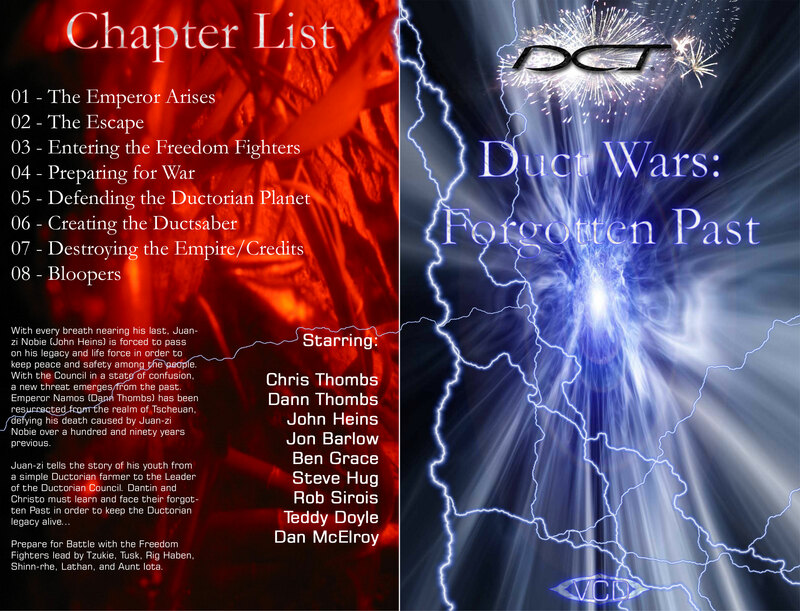 Ductorian Chronicles: The Chronicles tell the entire Ductorian story from start to finish. It begins with Tzukie and Cronaug forming the Freedom Fighters when Emperor Namos first comes into power. 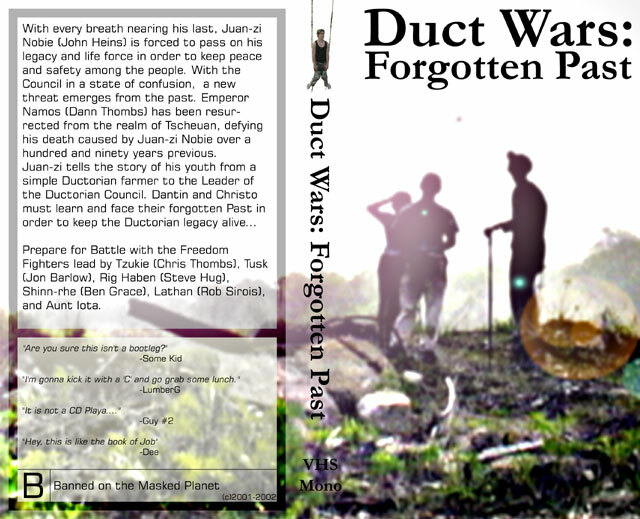 It Continues with Juan Zi Nobie's youth as told by 'Forgotten Past' where he fights against Emperor Namos. It contiues with Juan Zi Nobie training Dantin to join him in the creation of the Ductorian Council. Juan Zi Nobie and Dantin recruit Christo and fight the Mask inVader. 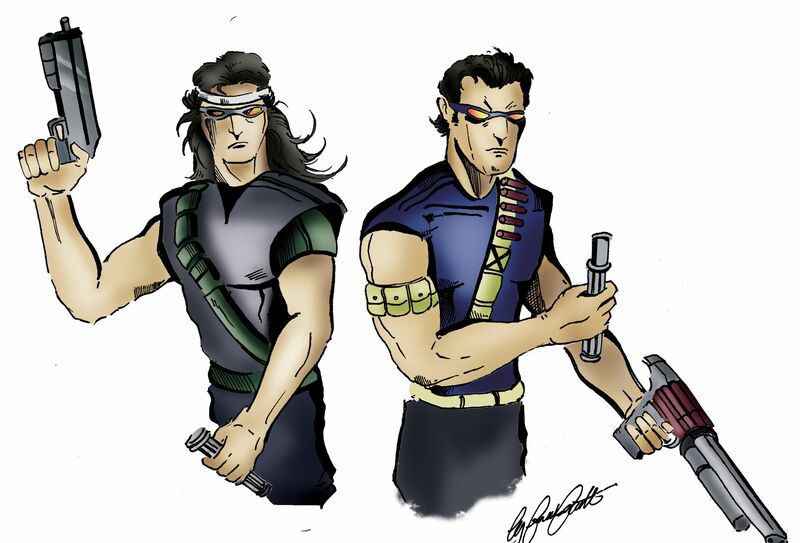 Years later Christo and Katano train Trebor to help fight Schlim who became the Silver Enemy. Emperor Namos rises and creates the Midnight Shadows, causing Christo to train a new student, Tsion. 4/13/2006: Thanks to Google Video, some of the movies are online. Part 1 and 2 are there in their entirety, and the trailer for part 4 is up as well. 5/11/2005: Ironically, I decided to update this page with a few other images, and noticed that it's been exactly a year. Not much has happened on the Ductwars front as we decided instead to consentrate on Rogue Entity, which came out very well. 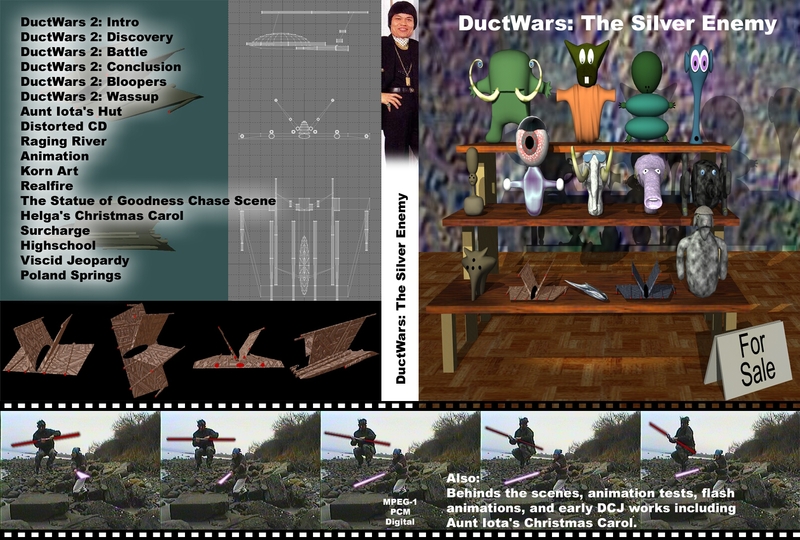 The future is uncertain, and Duct Wars: Chronicles looks a bit on the rocks, at least in terms of remaking part one and two. We may be able to make some more side stories however, but those will be short. 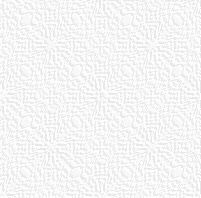 5/11/2004: Few more things to post. 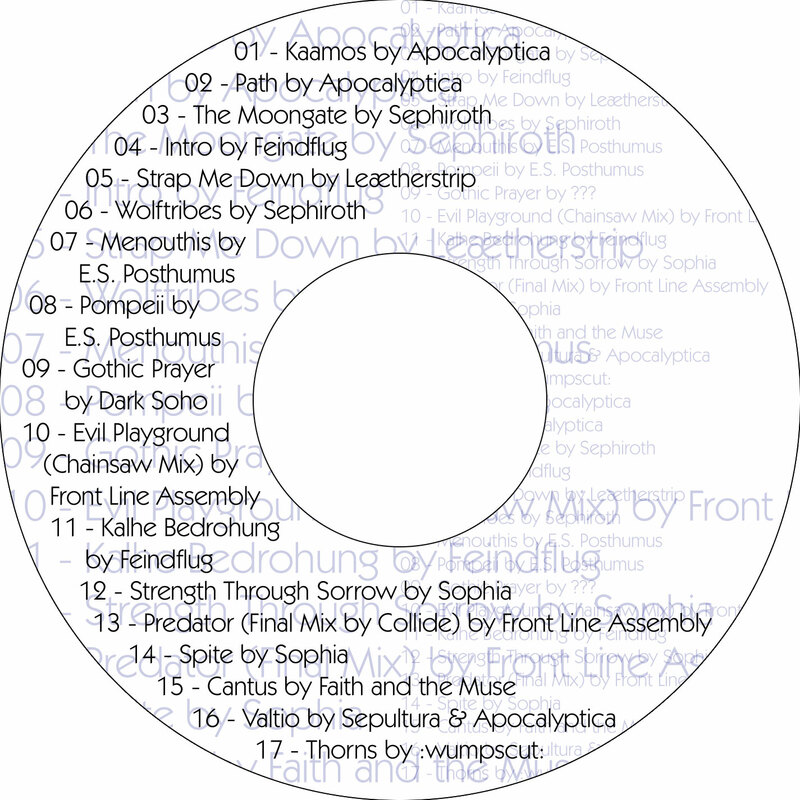 The labels, inserts and Soundtrack coveer are finished. 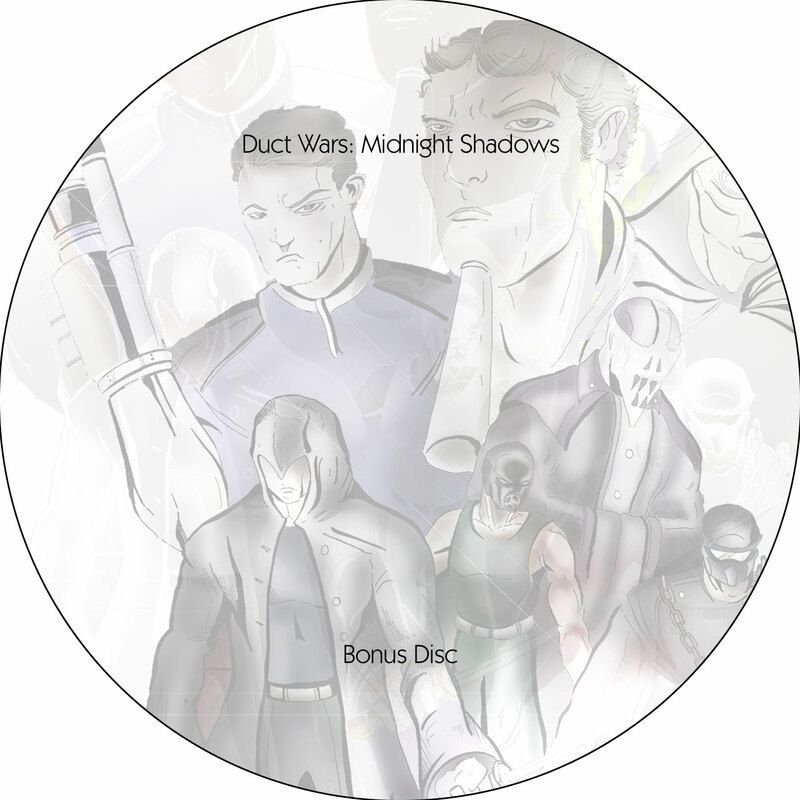 The thumbnails in order are: Main DVD Label, Bonus Disc Label, DVD Insert, Soundtrack Label, Soundtrack Cover. 4/22/2004: More Stuff to post. 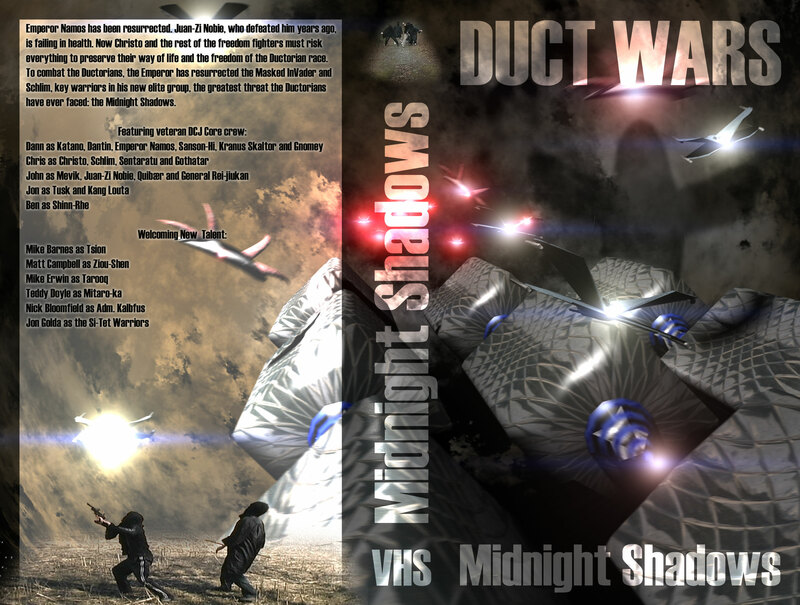 The DVD and VHS covers are done. 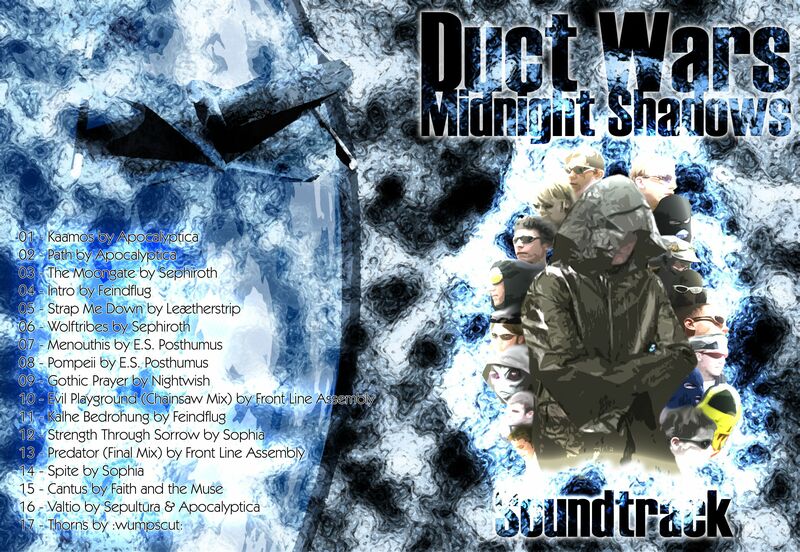 DVD production should be done tonight. Just had to tweak a few more things after the screening (location text, menus, dedication etc...). A trailer is up for everyone to download. You can find that here. As always you can view more cover and misc art on the DCJ Images site. 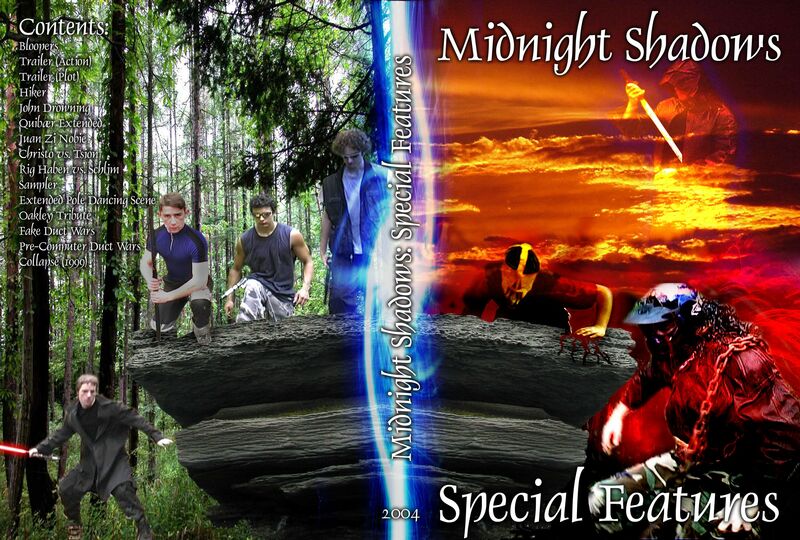 4/8/2004: The back cover for the Midnight Shadows DVD has been finished. You can view that above. I've also put pictures from the screening up. I will have a trailer up soon too. 3/29/2004: The movie finally got finished and the screening went very well. Pictures will be up soon. We had a very nice room to show the movie in, and the sound system was awesome. The laser blasts shook the room. People laughed at the jokes and clapped at the end, so that's about all you can hope for. The second half of the film festival will be on April 6th, and will feature other student work. Artwork for the DVD cover was present at the screening as well. You can view the higher quality image by clicking on the thumbnail. A: Those two movies were filmed on 8mm video, and captured as analog. Our filming techniques and special effects ability was premature, and was also seperated by two movies, Six Aces and Zombie Jamboree. Since then, we have gotten more people to act, switched to all-digital, and our skills have improved since then. Q: Won't there be a gap in quality if watching them all at once. 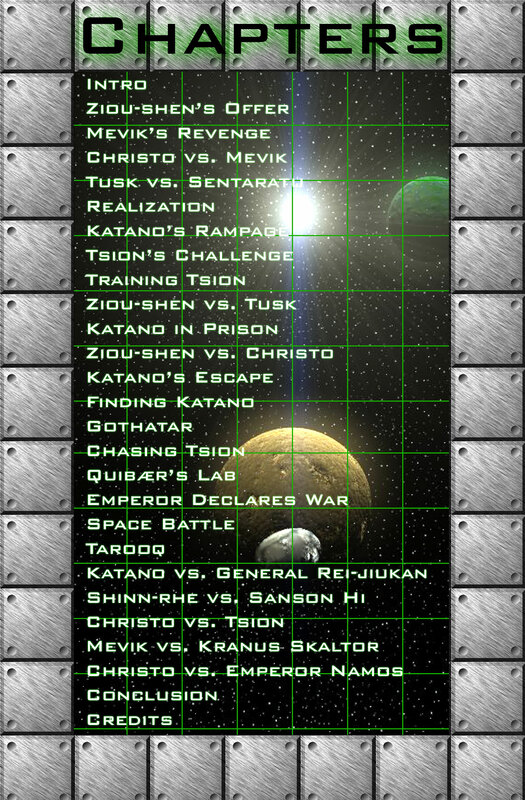 A: We intend to remake The Rebellion and parts of The Silver Enemy to make Ductorian Chronicles appear more consistant. The flashback that made up Forgotten Past will also appear chronologically. Q: Katano looks like Dantin in Forgotten Past. A: Yeah, hindsight's 20/20. We will fix that for Chronicles. It should have been Dantin. Q: Is this just a Star Wars parody. A: It was..at first. The lightsabers are obvious, and names like Juan-Zi Nobie (Obi-wan), Masked Invader (Darth Vader), and Aunt Iota (Yoda) all were based upon Star Wars things. After the first one, who's plot had nothing to do with Star Wars, we really branched out and made our own thing. The ductsabers stayed because they're really cool, but other than that, there's really no connection anymore. I didn't even watch anything more than the first Star Wars until almost the end of the Second DuctWars. Q: What's the history of DuctWars. Who When Where Why? Q: You totally stopped in the middle of that last answer. A: Yes, the last sentence was so powerful, I had to let it take effect. So anyway, we finished the first episode in 3 months. It was full of unshadowed 3D and solid shade ductsabers. It was only 16 minutes long but took a lot out of us. After completion, we started on the second one, despite being called crazy. This one started off in the same fashion as the first, but we started to noticed things that went wrong in the first. First of all, the 3D didn't have the correct lighting angle as the scene it was in. I added shadows and tried to integrate the 3D more with the actors. We blew some things up and experimented more with image overlays and frame effects. The Sabers went from solid shade to having white in the middle, mostly due to the fact that I saw how lightsabers really looked in a magazine. This episode lasted about 45 minutes, and was much better than the first. Q: So now you're going to explain how the second two got better. A: Why yes, I will.... In between the second episode and third, a few things happened. First, I helped edit 'The Blue Potato', a Portsmouth Abbey student film. I finally found a method to make realistic saber effect, which would stand out more in a dark background than a light one. The other methods would be the same intensity regardless of the environment. With that done, we moved on to Six Aces and started to make sure the movie effects didn't look too cheesey. So no more out of place 3D and puppets. The only 3D we had in Six Aces were some mosquitos, which with the motion blur, weren't too bad. After that movie, we started Zombie Jamboree, with our new digital camera. Six Aces used this camera for a few scenes, but we downsampled the footage to match the frame size of the analog material. It still looked better though. 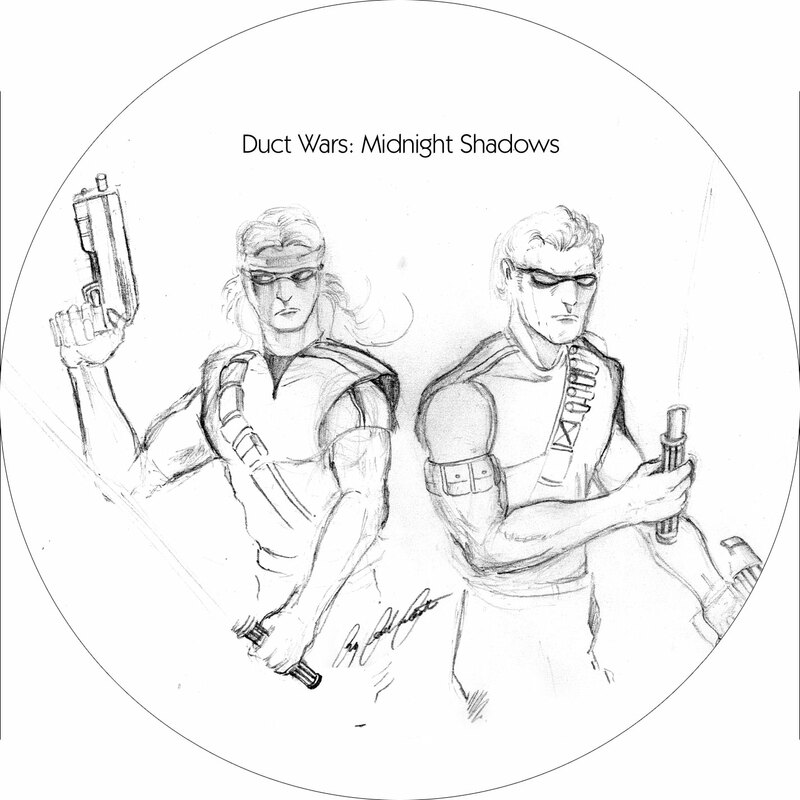 Q: You didn't mention a thing about Duct Wars. A: And you've stopped asking questions. So anyway, we got the new camera and the quality was amazing. We switched to fiberglass rods instead of broomhandles for the sabers. They're neon, which stands out better, and won't break. We picked up a few more actors who had some roles earlier, Steve (Six Aces), Jon (6A), Dan (6A), Ben (6A, Zombie Jamboree) and a few more who were't in any previous movies. I used 3D sparingly, but I made sure that shadows looked good and the effects were at least convincing. The fight choreo had more time put into it as well as the plot. The only problem was with the technology. The digital was great to film with, but had two downsides: data rate and generation loss. Q: But the advantage of digital is getting rid of generation loss. A: Yes, in theory it was, but multiple compression saves also have a similar effect. Each time you save, it recompressed the data and loses quality, even if you haven't modified anything. We had this problem with the analog footage once it was digitized, but only when and effect was placed in the scene. The other problem was with the data rate. The footage is over 3 meg a second, so the computer needs to be pretty fast. The footage would skip like a madman when capturing onto the computer. It wasn't bad at first when the computer was new, but got worse over time. At first I thought it was because we were reusing tapes, but the HD was just fragmented and not the speediest thing. Plus I used the computer for other things and the overhead was pretty bad. For the fourth chapter of Duct Wars, we just filmed for a year and a half and didn't bother with the editing. I got a new computer and was going to wipe out the old one and start from scratch even though the newer one would have been better. Then suddenly we got a computer donated to us which was very fast and even had the needed firewire ports and a DVD burner, something I wasn't even going to dabble in, but now was able to do. So since then it's been smooth sailing without a single dropped frame. The compression loss was also fixed in later versions of the Studio Program. So all is well now, and now that the technology won't get in the way, we are going to redo the first two episodes and make them right this time. A: Then continue to the DCJ page you merry man! DCJ Productions - The main home for all DCJ related info. Goshzilla - The site for one of our characters. He now reviews B-movies. 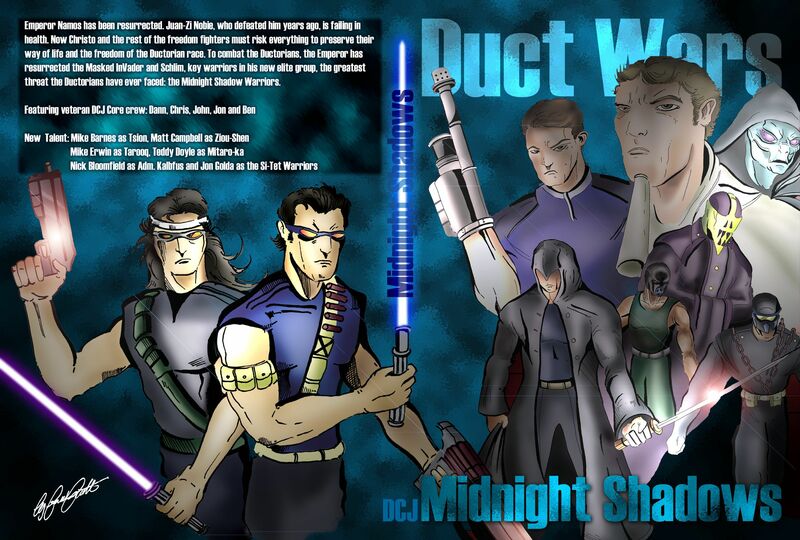 DCJ's use of Duct Wars is strictly educational and not-for-profit. All movies were meant as a basis to test filming techniques and technology, as well as having some fun. 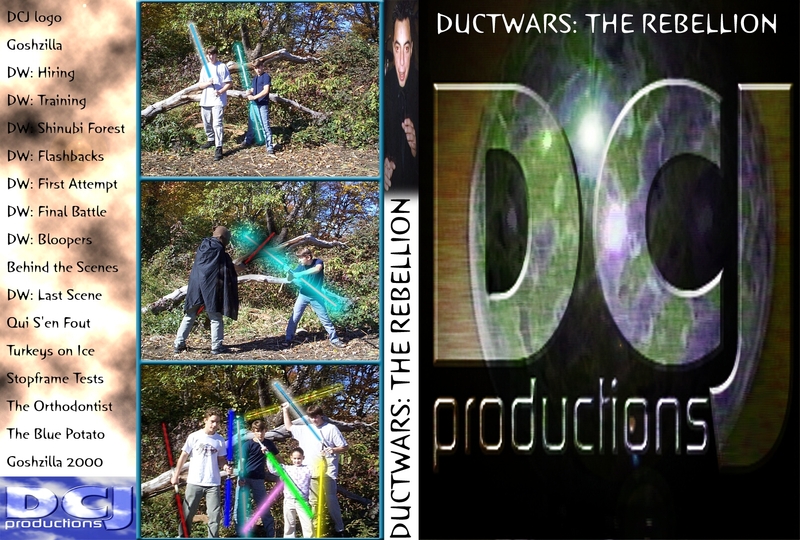 DCJ acknowledges the many similarities between Duct Wars and Starwars, and takes no ownership for 'sabers' or similar names used.